Last week we talked about the nasal cycle – the fact that at any given moment one of your nostrils is more open then another and it alternates in a rhythmical fashion. Scientists also discovered that when your right nostril is dominant, the EEG activity is greater in the left cerebral hemisphere (each hemisphere controls the opposite side of the body), and when the nostril dominance switches, so does the activity of the brain hemisphere. Basically what they are saying is that in the course of the day one hemisphere becomes dominant and then another in a rhythmical fashion and it switches back and forth, and it is directly linked to the nasal cycle. This is called alternating dominance of cerebral hemispheric activity. So if you want to know which side of your brain is more active right now, check which nostril feels more open. If the left nostril is more open, then your right brain is dominant right now and vice versa. That’s pretty fascinating, considering that our right and left hemispheres experience the world very differently. It seems that the scientific community had disposed of the popular idea of right brain as the creative one and the left brain as the logical one – nothing in the brain is that simple. Instead it is widely accepted that both sides of the brain are necessary to perform most tasks, they just handle them a bit differently. It appears that the biggest difference between the hemispheres is the way they see the world. Our right hemisphere lives in the now and experiences each moment individually and every moment is vibrant with sensation. Think back to some of your more vivid memories – these are the snapshots in time made possible by the right hemisphere. The right hemisphere sees the world as a whole, and is more connected to rhythm and flow. It prefers uniqueness and is involved more with new experiences, events, things, ideas while they are still fresh and original. It is more skilled at recognizing relationships between things and allows you to see the big picture. Ultimately, it is interested in understanding and experiencing the world. Our left hemisphere, on the other hand, takes all those vibrant moments and strings them together in the linear fashion, organizing them into past, present and future. The big picture perception is broken down into manageable and analyzable bits of data that are then compared and evaluated. The left brain is more involved with things that are familiar and known, it prefers to generalize. The left hemisphere views a world more like a map or a model, which is a representation of the real thing. It defines the concept of “self” and keeps track of who you are, where you live, what your credentials are. That little voice that always compares yourself to others resides in the left hemisphere. Ultimately, the left hemisphere is interested in manipulating the world to your advantage. The cooperation between the right and left brain is essential for us to learn better, function more intelligently and become proficient in anything. Whatever it is you are engaged in – reading, writing, music, art, sports – each hemisphere has something important to contribute for you to have access to both technique and inspiration. In fact, both developmental diseases and abnormal information processing (like autism and schizophrenia, for a example) have been linked to a “dysfunctional integration among neural systems”. Therefore optimal balance between the hemispheres is vital. Right and left hemispheres approach the same tasks from different angles. We tend to favor one hemisphere or the other on certain tasks. Hemispheric dominance shifts back and forth throughout the day. We need to integrate the function of both hemispheres to learn better, to understand better and become proficient at anything. How do we do that? Through movement! Each hemisphere has sensory and motor control of the opposite side of the body. Therefore moving both sides of the body at once in a rhythmical fashion will facilitate brain integration. Have you ever noticed that it’s easier to think if you are doing something rhythmical, like walking, or knitting or may be even chewing? I know I come up with all my post ideas while cleaning my house. But there are certain specific movements that you can do to facilitate even better hemisphere integration and it has a lot to do with brain development in childhood. 1. Cross-lateral movement (cross-crawl) is basically when both sides of the body work at the same time completing alternating patterns of movement. We do it all the time in our everyday activities (walking, climbing stairs, riding a bike). We don’t do it if we sit at the desk all day. 2. Crossing the midline is the ability of the one side of the body to cross over to the other side by moving across the centerline of the body. In childhood, crossing the midline of the body helps build pathways in the brain and is necessary for developing skills like reading, writing, self-care tasks and complex physical activities. 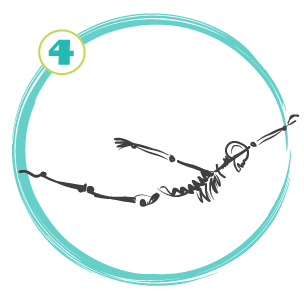 Crossing the midline exercises are often used in pediatric therapy to help kids with learning disabilities. 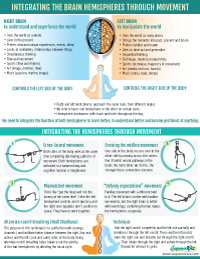 Anytime the left and right side of our bodies work simultaneously or one side of our body crosses the midline over to the other side, the brain is compelled to send signals back and forth from one side to the other. The more times we do this, the stronger these connections become. 3. Mismatched movement. Tricks like “pat the head and rub the tummy at the same time” are difficult to do. 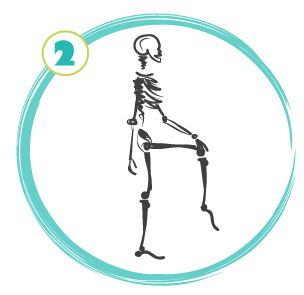 Try this trick: circle your right ankle clockwise, then draw number six with your right hand. You foot will change direction. Mismatching the movements of your hands and/or feet is a good brain exercise that promotes coordination. For example, you can ask your students to do a bridge pose, and have them raise one arm up and bring another arm over the head. Here the left hemisphere controls arm trajectory, and the right hemisphere regulates arm’s position in space. They have to work together on this task. 4. “Defying expectations” movement means taking a familiar movement and introducing a different variation. 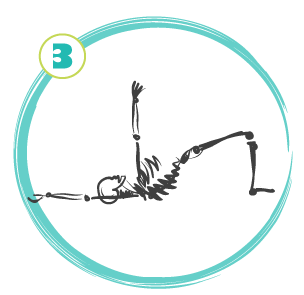 For example, ask your students to do Shalabhasana (Locust pose) and bring one arm forward and another one out. This is not what they are expecting! Remember, the left brain is better with familiar movements, but the right brain is better with new things, so by combining familiar and new you are encouraging your hemispheres to cooperate. In viniyoga, we practice this a lot by using pose adaptations (different arm, leg and head movements). Adaptations both give us access to specific body areas and make us pay attention. And then there is the alternate nostril breathing (Nadi Shodhana). From the yogic prospective the purpose of this technique is to purify the nadis (energy channels) and facilitate better balance between the right (hot and active) and the left (cool and calm) sides of the body. As we mentioned above, the nasal cycle appears to be strongly linked to the opposite hemisphere dominance, which may indicate that doing alternate nostril breathing helps balance out the activity of the two hemispheres. This is exactly what this study found. 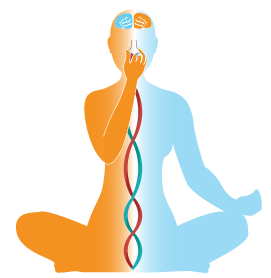 D. Shannahoff Khalsa writes: “It is likely that the effect of the alternate nostril breathing technique can directly affect the lateralized sympathetic and vagal input to the heart, thereby inducing a balance in ANS (autonomic nervous system) activity. This may help to reset the electrical patterns affecting the heart muscle.” Pretty incredible! Next week we will feature a yoga practice that utilizes all of the above movement patterns to promote more balanced hemispheric integration, better focus and coordination. Tune in! Do you think that it’s possible to activate a hemisphere if you prefer to use that side for an activity? For example, say you want to get into a more creative mode because you’re going to do some writing, could you do a breathing exercise to activate the left nostril/nasal passage thus activating the right hemisphere? Back in college when I had a paper to write, I used to always put on a Sade CD (it might have been a cassette back then!) because I felt like it got me in a creative mode and helped me write. At the time I was convinced it worked! Hi Marjorie! I think that it’s certainly worth a try! When it comes to writing, I believe that both hemispheres are equally important – the right one provides imagery, inspiration and free association, and the left one lets you put it into words and structure the sentences effectively. I think we all got tricks that we know help with writing – going for a walk, listening to music, doing some yoga… All of these appear to use both hemispheres. So integration might be more important then trying to activate a specific one, but I would love to hear about your experience! This was exactly what I was looking for! Where can I find out even more? I have a question.. ive read in a few articles that non of us is on the left or the right side of the brain and we use both of them all the time..consciousness is intergrated is like a fusion..i dont understand the term “switch” by one hemisphere to the other..if we use both of them at the same time how can switching resulting?